I was really excited to try out the babyBumBrush with my new little one. I always hated how messy diaper creams were to dig out of the tub and how the product gets everywhere. Then the clean up was always a big project as the cream was all over my hands by the end. This new baby product from Mompreneur, Kristina Cash, keeps your hands neat when you wipe baby's bare seat! 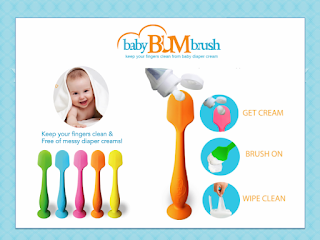 1) Baby BUM Brush™ is made from incredibly soft 100% silicone and is compliant with California Prop 65. 2) The suction base allows it to stand on almost any surface, keeping the cream off your changing table. 3) It works virtually any diaper cream and guarantees better coverage for better protection. Clean up is easy with one simple wipe. This is a neat product. I love the material is soft yet sturdy. The suction cup on the bottom allows me to stick it to the diaper rash cream tub we have so it is always easy to find and grab. It really did help keep things less messy when applying the cream and my son didn't mind it one bit. Clean up is a breeze as you just do a quick wipe with a baby wipe. Visit babyBumBrush.com for additional information or to purchase yours!